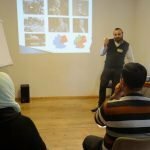 Working in Germany: obstacles and opportunities for immigrants – The 3rd workshop “From Almanya to Germany” on 04.01.2019 in Leipzig – DOZ e. V.
DOZ and the project team “From Almanya to Germany” wishes you a healthy new year! We have new and exciting projects to kick off the year! Today, January 4th, the third workshop in our project “From Almanya to Germany” took place in the Pöge-Haus, Leipzig. This time it was about the German job market. In the first part, the participants were given basic information, facts, and figures about the labor market. Together, they developed commonalities and differences between Germany and Syria. For example, it was noticeable that in Germany you are paid according to the working hours, whereas in Syria you are paid for a service provided, regardless of the duration. More differences were noted in the gender distribution in the working world. The second part of the workshop was dedicated to the difficulties and opportunities that refugees have in the German labor market. On one hand, the participants in two groups dealt with problems that could make access to the labor market more difficult. These include discrimination, poor language skills, age, bureaucratic hurdles, differences between cultures, and associated misunderstandings. On the other hand, there were motivating factors that could facilitate access and success. Participants noted the opportunities to help at a local, societal, and state level. Germany has diverse opportunities for furthering education and experience, such as trainings, internships, and equal access for men and women. The subsequent evaluation showed that there are many hurdles, but just as many opportunities. This motivated the participants, especially the women, to become active themselves and not to be afraid of the German labor market.